POWERED HAULAGE JUNE 2018 • E&MJ 59 www.e-mj.com gested. "It should probably be the grader operator or a water truck driver, somebody who is familiar with these large trucks," Trainor said. "One person could concen- trate on driving the vehicle while the oth- er explains to people what they are seeing on the tour." Earlier in the year, a miner was fatal - ly injured when his light-duty truck was run over by a haul truck. This incident happened at night. This person was try- ing to make a personal call on his mobile device, Trainor explained. "The best re- ception was at the top of the mountain," Trainor said. "He parked in the dump area and turned off his lights because he didn't want people to know he was using his phone. Unfortunately, the haul truck ran over him." In this case, a collision warning sys- tem may have recognized a parked ve- hicle. The haul truck operator, howev- er, did nothing wrong and he definitely would have seen him if he had turned the headlights on. Examining the situa- tion with the light vehicle, Trainor said, he had a family matter distracting him as well as the device usage. "He was talking to a family member when the accident happened," Trainor said. "These distrac- tions had him thinking unclearly on a couple of levels. Again, this is another distracted driver." The third example Trainor cited in- volved a wheel loader running over a small vehicle. The small vehicle driver went to pick up the wheel loader operator and truck drivers and bring them back to the office for lunch. 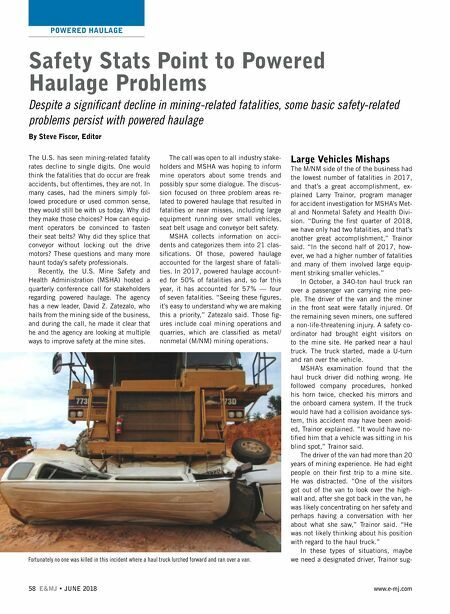 He parked too close to the wheel loader, Trainor explained. The wheel loader backed over the passenger side of the truck. The driver was trapped in the car when a fire broke out and the victim burned to death. Again, a collision avoidance system may have helped, but the operator was not found to be at fault. Looking at the situation with the small vehicle driver, there were several variables, Trainor ex- plained. 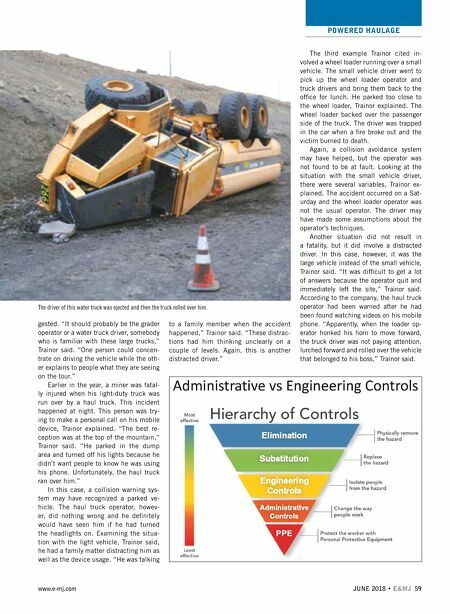 The accident occurred on a Sat- urday and the wheel loader operator was not the usual operator. The driver may have made some assumptions about the operator's techniques. Another situation did not result in a fatality, but it did involve a distracted driver. In this case, however, it was the large vehicle instead of the small vehicle, Trainor said. "It was difficult to get a lot of answers because the operator quit and immediately left the site," Trainor said. According to the company, the haul truck operator had been warned after he had been found watching videos on his mobile phone. "Apparently, when the loader op- erator honked his horn to move forward, the truck driver was not paying attention, lurched forward and rolled over the vehicle that belonged to his boss," Trainor said. The driver of this water truck was ejected and then the truck rolled over him.